This Manhattan apartment overlooks the city and Washington Square Park, and is decorated with copper leaf screens to reveal storage and a fold-out bed, and a spatial design to focus on framed views. 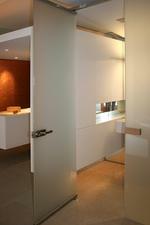 Interior spaces are designed to fulfill multiple functions and disappear. The screens, highlighted by concealed accent lights, provide a back drop for the living/dining room and give the illusion of a space beyond. 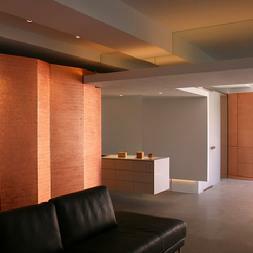 A cove above provides soft indirect lighting and defines space between the living and sleeping areas. Lights concealed under cabinets create the illusion of floating objects. 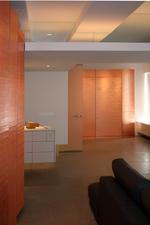 The frosted glass enclosed bathroom contains a decorative vanity light and a color changing cove. The kitchen incorporates a ceiling cove to simulate a skylight with warm and cool sources to match daylight. The residential necessities are treated as furniture that defines the inner surface of the space.